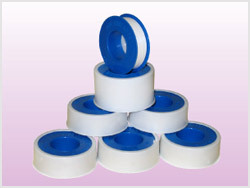 Teflon Pipe Thread Seal Tape is a quick, convenient thread sealant that is designed for sealing threaded pipe joint. It can also be used on iron, stainless teel, copper, brass, plastics, glass and synthetic rubber. It is resistant to acids, alkalis, solvents, and steam. Total Thickness : 3 Mil.